Periodontist Livingston, New Jersey – Samantha Aaron, D.M.D. The aesthetic component of The Silverstrom Group was developed on the principal that a beautiful smile must also be a healthy smile. Good oral health is the foundation of a bright, radiant smile and is essential to one’s overall quality of life. This is why Dr. David Silverstrom and Dr. Gary Silverstrom have assembled a team of professionals that will provide you with the highest standard of oral health care in dentistry. By adding periodontist Samantha Aaron to our Livingston practice, we feel that we have made the premier dental group in the area even stronger, to the benefit of patients throughout New Jersey. A native of the Garden State, Dr. Aaron is proud to bring her unique skills and extensive training to The Silverstrom Group. Proper periodontal care requires collaboration between the periodontist and the patient. While there are a variety of procedures available to prevent and treat gum disease in its various stages, excellent periodontal health depends on the patient’s commitment to maintaining healthy habits and a stringent oral hygiene regimen between dental visits. Dr. Aaron creates lasting partnerships with her patients by providing them with gentle care and the education they need to have healthy mouths for a lifetime. Her compassion and personable chairside manner help to put even the most anxious patients at ease. Furthermore, our patients will find in Dr. Aaron a skilled periodontist who shares our total dedication to their safety, comfort, and overall satisfaction. We are excited that she has decided to join The Silverstrom Group, and she is excited to further our mission to provide dental care of unparalleled quality and efficacy. To learn more about periodontist Samantha Aaron or to schedule your initial appointment at our cosmetic and restorative dentistry practice, we invite you to contact The Silverstrom Group today. Samantha Aaron grew up in West Long Branch, about sixty miles south of The Silverstrom Group. She left New Jersey to study at the School of Kinesiology at the University of Michigan in Ann Arbor, where she developed insight into the various interactions that occur within the human body and how they affect movement. After graduating with distinction in 2002, she returned to her home state to earn her D.M.D. from the University of Medicine and Dentistry of New Jersey. While there, she was named to the Dean’s List every semester and was an active member of such academic organizations as Gamma Pi Delta Prosthodontic Honor Society, the American Student Dental Association, the Fauchard Dental Society, the Alpha Omega Fraternity, the Xi Psi Phi Fraternity, and the American Association of Women Dentists. She went on to obtain her certificate in periodontology from New York University in 2006 and is a diplomate of the American Board of Periodontology. Dr. Aaron’s professional career has been as rich and diverse as her educational career. Since earning her certificate in periodontology, she has worked with some of the most distinguished dental professionals throughout New Jersey and New York, honing her skills and expertise while building a reputation as one of the area’s premier periodontists. 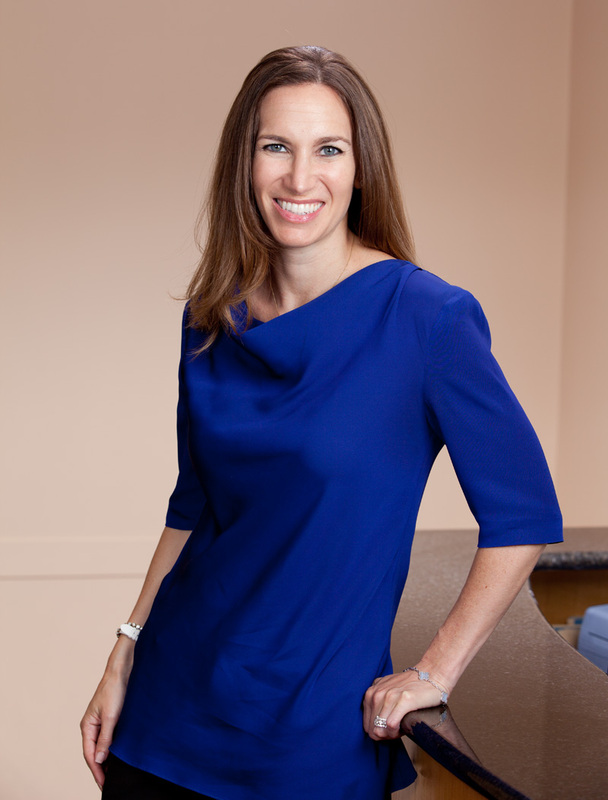 For the past few years, she has maintained specialty practices in both New York and New Jersey, and she now joins The Silverstrom Group to focus and expand upon the philosophy that is manifest in every facet of the award-winning practice. Dr. Aaron participates in many hours of continuing education courses each year and has presented on such topics as ramus block grafts and cone-beam versus conventional CT scans. She is also serving as co-investigator in a research study headed by Dr. Dennis Tarnow. When she isn’t working with our patients or furthering her knowledge and skills, Dr. Aaron can most likely be found spending time with her family and friends or pursuing one of her many interests. She loves traveling, reading, exercising, running, golfing, playing tennis, following sports, and enjoying summer days at the Jersey Shore. She has a true passion for everything she does, whether it’s surrounding herself in culture or performing periodontal treatments. The Silverstrom Group invites you to discover for yourself exactly why we are so thrilled to have Dr. Aaron become part of our team. We think you’ll agree that she truly is something special. If you would like to schedule a consultation with periodontist Samantha Aaron or any other member of The Silverstrom Group team, please fill out and submit the form below. We would be pleased to assist you.